I was supposed to come home and make some broccolini for dinner and then let my "cooking creative juices" run wild from there. That didn't happen. I made the (amazing) mistake of opening up my freezer first and saw the three cheese pizza staring back at me. It was speaking to me and it said, "screw your broccolini...don't you want your son to LIKE you? MAKE ME" Done. I was about to put it in the oven and started having MINOR pangs of guilt that I thwarted my healthy dinner plans for a frozen pizza, so I grabbed some garlic and fresh basil out of the fridge and put it on top. I then broiled some baby tomatoes coated in olive oil, salt and pepper and figured the meal wasn't really that bad for us. And for the record, I am always amazed at how good this pizza is and it basically costs the same as my subway commute to and from work. And since dad was at happy hour (but really the happy hour was taking place in our kitchen) with friends, it was just me and Jenson who got to eat this glorious pizza. However, I underestimated how much he would like the pizza topped with garlic and basil so I had to share a bit more than I was prepared for. I know mother's instinct dictates you should want to GIVE to your child, but when it comes to pizza I have a different mantra. It's called, fend for yourself little one. 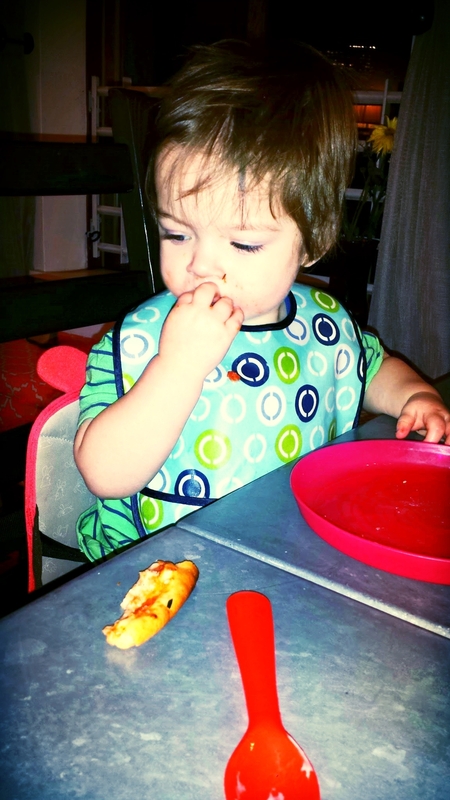 And while his daddy wasn't there, he seems to have gotten the "I don't eat crust" gene from him. Which I think is akin to pizza blasphemy. But I suppose that means more crust for me.